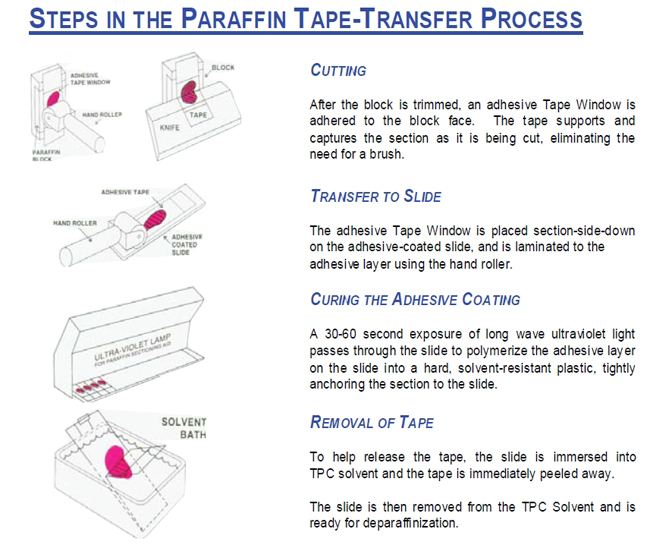 The Paraffin Tape-Transfer System utilizes a tape-transfer method similar to CryoJane® for the rotary microtome. Sections are captured flat and uncompressed on a tape-window as they are cut and then transferred to an adhesive coated slide. It is very useful for difficult-to-cut paraffin sections, sections that are poorly fixed or poorly infiltrated. Sections are immediately ready for deparaffinization. It is the preferred method for tissue microarray sections. The method eliminates the need for the water bath and drying step.